i am so happy we are getting OG Remasters, these are the 2 best games in the series and i love RA1 too death. i would kill for a Nintendo Switch Port as well. this will be the reason for me to upgrade my PC again. so happy!!!!! And Petroglyph looking after it, lets hope EA Trust them to do the full treatment of the series. Petroglyph must be so desperate that they decided to do this with EA for remastering C&C games. Plus a third studio is involved to do the 4K remastering. But...... most ex-Westwood guys already left Petroglyph and ex-EALA (formerly EA Pacific). Other than Joe Bostic, is Brett Sperry coming back as well? With this news, maybe Petroglyph can create a future new C&C game... if EA allows them to. They are not desperate. They wanted to do that for eons already. Depends on whether they've woken up from their 8-Bit Armies/Forged Battalion phase and whether EA's budget will affect the quality of the remasters. The art will be done by Lemon Sky Studios (who did the same for StarCraft: Remastered) and they're working on remasters and not new games after all, so if they manage to botch this up with all those things considered, then they should finally close. If they don't, then they might be redeemed after a few such projects. Too early to tell. At least they seem genuinely invested from brief communication. Hoping for Tiberian Sun Remastered too in the future...because it's time you saw the future!! At any rate, it's probably going to be a bit more complex than with StarCraft's graphics, but I do hope they'll be showing the WIP stages and consult with the community as the Reddit post suggested. What I found out about Lemon Sky Studios is that they are partnered with a lot of studios back then and is located in Malaysia. I think I'll trust the Asian gaming studio on this one though. Here's a thing I thought concerning the remaster of Command & Conquer (reposting from another forum). Originally, C&C envisioned a modern conflict, implied to be happening "twenty minutes into the future", and it is actually one of the central themes around which the entire setting of the game is built. 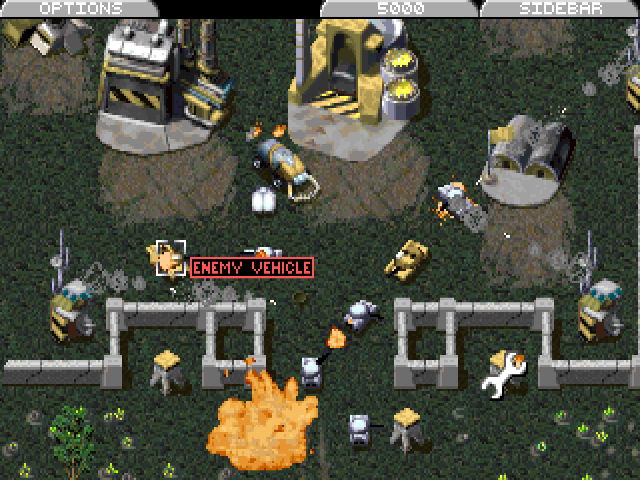 For example, EVA is not simply a fancy name for the user interface, it is supposed to be military software used for remote battlefield command from a personal computer, with the player being invited to be that commander by installing the game. This is drastically different from all the other games in the series that take place in time frames outside from the present, and the commander person is accordingly a fictional character whose role the player assumes but does not necessarily identify with (TS ditched the player commander convention entirely, only to bring it back in Firestorm). I believe that great care must be taken to preserve this unique atmosphere of the first game in a proper remaster, something from which the Windows 95 Gold edition unfortunately started to deviate (for example, the high-res menu fonts no longer match the green EVA font used in the FMVs like shown above). The thing is, Command & Conquer has become "retrofuturistic" with the passage of time. For example, the intro sequence with switching TV channels before tuning into the GDI/Nod transmissions makes a lot less sense today than it did in 1995, especially to the younger audiences. Of course it can be accurately preserved, but then again it could be reimagined in a modern way (e.g. by imitating web browsing instead of watching TV). There's no immediate answer to which is the right approach, but it highlights the fact that updating a game like C&C for a modern audience and tech goes beyond simply redrawing graphics in higher resolution and adding interface improvements. My personal opinion is that leaving everything as it is would be a sloppy job. This leaves two viable options, either update the setting to a modern one (2018 instead of 1995), or emphasise the fact that it's 1995 while sacrificing the "twenty minutes into the future" feel and making the result a true piece of retrofuturistic fiction. Either way it would require some creative talent to pull off properly I guess. Sorry, but why would they do that? The "modern audience" doesn't know what an RTS is even, so why would anything of the sort be changed for an audience that won't care about it anyway? This is the one chance they have to satisfy millions of fans the series gathered over two freakin' decades who appreciate it for what it is after deciding to use "modernization" as an excuse to take a dump on the series. The stupid smartphone generation has Rivals already. Leave TibDawn and RA1 where they are. Maybe I worded this wrong, I meant to say that back in 1995 when you got C&C and installed it, there was a framing story that the "game" is actually advanced military software that allows you to command real-life troops in a real life conflict that was happening right now, with you, the player, having been recruited by either side of the conflict to command their forces. This was supported not only by the internal consistency and narrative of the game but also by the fact that it depicted a world that was very little different from the real world of 1995. The TV and news clips, maps and other stuff are all there to support this immersion. However it's over 20 years since then and the world has changed in many ways, as a result detaching this aspect of the game's story. I mean, I don't know about you or others, but whatever the remastered version turns out to be I probably won't bring up a level of suspension of disbelief to maintain this immersion that was intended by the original developers back in 1995. I mean to say that there's no way around the fact that the original Command & Conquer depicts a very close future, but that "future" has now become "past". The remaster may or may not emphasise this fact, but this, shall we say, discrepancy will exist because the remaster will be a new, modern title (by which I simply mean its time of release, not any implied design particularities). So do we imagine that the player of the remaster is the commander, or that the commander is a fictional character from the fictional 1995-and-beyond timeline? If I were working on the remaster I'd at least ponder the ways of playing around with this. To conclude and avoid further misunderstandings I'd like to emphasise once more that nothing I said above concerns making the game more accessible to "modern audience" as in "players unfamiliar with classic RTS games". I never intended to suggest anything like that, sorry if my wording was misleading. I mean, I don't know about you or others, but whatever the remastered version turns out to be I probably won't bring up a level of suspension of disbelief to maintain this immersion that﻿ was intended by the original developers back in 1995. Of course, because you played it over two decades ago. You can only have one first impression. Storytelling and worldbuilding have come a long way since then, but when you touch anything related to that other than audio/video fidelity in an existing game, you change not only the canon, but the general feeling of the game. You have to understand one more thing, though - pretend-army stuff was pretty popular in media in the mid-1990s, likely because the Gulf War was still fresh in people's minds and the wars in Croatia and Bosnia were still going on (guess why Sarajevo was Nod's main hub?). You can't change this stuff just because it isn't topical anymore. I mean to say that there's no way around the fact that the original Command & Conquer depicts a very close future, but that "future" has now become "past"﻿. The remaster may or may not emphasise this fact, but this, shall we say, discrepancy will exist because the remaster will be a new, modern title (by which I simply mean its time of release, not any implied design particularities). The remaster doesn't have to emphasise this because everyone will already know that it's a remaster of a 1995 game, and nobody except the thickest of people who don't understand that remaster =/= remake will understand that that means limitations have to be placed on how much can be changed before it stops being the same game and even the same canon. That's what buggers me a bit. The original game is internally consistent yet frozen in its time so to speak. Whereas of the remaster, I cannot tell how it will turn out in after all of course but somehow I cannot bring myself to not think of it as a "new" game. Whatever the developers do there will probably be a huge overhaul of the graphics at any rate because the DOS 320x200 stuff cannot look good by simply redrawing it at a larger scale, because the models have very scant detail (luckily there are high-res renders for almost anything for the artists' reference), unlike StarCraft's art which is still pretty detailed even though it may be considered "low-res" by today's standards. I'm somewhat concerned that if the developers take a conservative route with only bringing the visuals and sound to higher quality and resolution, that would inadvertently serve to highlight how dated the game itself is (don't get me wrong here, Command & Conquer the first game is my favourite). Possibly it's just me but makes me think in the direction I tried to describe above. There's also the context. C&C came out in 1995 when it was one of the pioneers of a budding new genre, built on the foundation that was laid out by Dune 2. There was a logic to its coming into existence, and the authors also managed to nail the Zetigeist of that era so to speak. But today the remasters seem to have been announced mostly because it's a trend, everyone else is doing this, so why not these games too? And unlike StarCraft which has few rivals in terms of popularity to this day, it seems that C&C and RA have become somewhat of a niche. I mean, even among those who play and love both (or either) game(s), how many would really like to see the recreations follow the closed-up view of the DOS versions? I'm almost certain many are used to the Windows 640x400 look of these titles, not the original DOS look of C&C. And even that aside, there's a balance to be kept between appealing to the "old-timers" who remember the original game, and everyone else, if they would care at all (your replies above appear pretty sceptical of this). EALA/Victory Games did have various VHS tapes from the Westwood-era FMV shooting sessions. We know those were thrown away, but we don't know if they were digitally archived first. this will be the r﻿eason for me to upgrade my PC again. so happy!!!!! Depends on how much they'll change the graphical system and the code. Good luck running Age of Empires II: HD Edition on a 2003 computer. well considering i run my life now on a surface Laptop, it gives me a good reason to Build a PC, but good time frame for me to get it right!